The many nooks and crannies, islands, bays, and stunning sunsets of Nootka Sound on the West Coast of Vancouver Island make it a popular destination of exploration for nature lovers. As well as being an area of cultural and spiritual significance to the Mowachaht people, Nootka Sound on the West Coast of Vancouver Island is also a mecca for nature lovers. 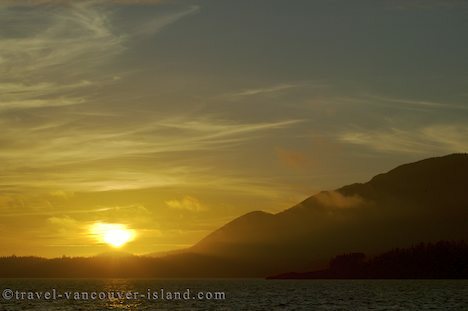 By day, the waters and coastline of Nootka Sound are a treasure trove of sea life while late afternoon brings with it glorious sunsets which grace the skies and turn the landscape and sea into molten gold. Sunset in Nootka Sound on the West Coast of Vancouver Island, BC, Canada. Picture of the sunset silhouetting the mysterious mountains surrounding Nootka Sound on the West Coast of Vancouver Island.